“These guys have the friendliest staff I have ever worked with. They completed everything not only quickly but with great quality as well. Jed in customer service walked me through everything I needed step by step. Wade called to suggest changes to make my menu even better than before and business has never been better since starting with Online Orders Now!! Definite 5 stars” – Michael K.
As Michael graciously observed in the above testimonial, Online Orders Now is a provider of online ordering software for restaurants that has been around for over a decade due to our commitment to offering solutions for our clients that simply make their lives easier. Whether you, as a prospective client, are interested in our websites, mobile web apps for food, restaurant online ordering software, mobile food ordering system, or even our catering or static menus, we prioritize ease-of-use and revenue generation with all that we do. When considering our non-integrated and fully-integrated POS options (it all depends on what you prefer), you can begin to understand exactly how we at Online Orders Now have separated ourselves from the competition. Below, you’ll find a brief description of who we are at Online Order Now, after which we will highlight our range of online ordering system products, features, benefits, and applications. We’ll look at a case study to help prospective clients understand the tangible benefits we can make at any given restaurant. After that, we’ll take a look at our POS integrations and partnerships, so that our prospective clients can gain a clear picture as to what they can expect when choosing Online Orders Now as their food ordering system provider. If you are looking to add an intuitive, easy-to-use restaurant online ordering software to supplement your revenue-generation strategy, we believe we are worth your consideration as a business owner. Learn why so many people are earning a substantial amount of money with our innovative suite of solutions for restaurant owners. In a word, it’s about value. We are passionate not only about being innovators in our field but about providing an exceptional all-around experience for both restaurant owners and their customers. With a commitment to customer service that goes beyond expectations, you can count on us to solve a range of problems that may come up. People choose us for our high-quality online ordering software, and often stay for both our contribution to increasing revenue and our outstanding customer customer service. 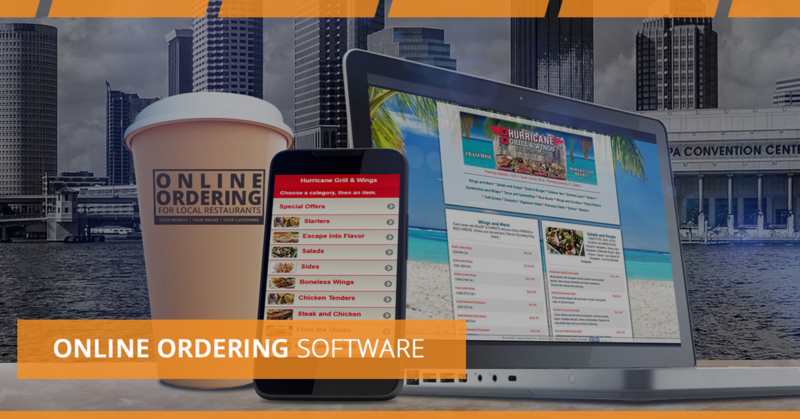 From a high-level, our online ordering software for restaurants will help business owners see a nearly instantaneous increase in volume, dramatically improved market penetration, and higher average ticket amounts, while still managing to lower net costs. Below we will individually highlight the various products that we offer at Online Orders Now, beginning with our online ordering software. We’ll provider a much longer list of features below, but the standard features of our online ordering software for restaurants includes unlimited transactions, first-time customers emailed, external delivery service email and fax notification, and administration back end. Unlimited Transactions – Irrespective of your total online order per month, you’ll pay the same monthly rate with Online Orders Now. We won’t impose any hidden fees based on volume! First-Time Customers Emailed – When you get a new customer who orders from your restaurant, we’ll email you automatically so that you can give them whatever special attention you desire. External Delivery Service – We’ll effectively “close the loop” when it comes to paper trails between your business and the third-party company you use for deliveries. We’ll send them a copy of the delivery order by email or fax to make sure everyone is on the same page. Administration Back-End – We offer a full-service product at Online Orders Now, and that has the net effect of providing our customers with largely self-sufficient products and services. We do the work for you. But if you prefer a more hands-on approach, we also offer an easy-to-use administrative web interface so that restaurant managers and owners can make real-time changes to aspects that include pricing, delivery times, business hours, holidays, item descriptions, and more! We’ll speak more on this below, but one of the most advantageous attributes our online food ordering system boasts is that we are fully integrated with the most popular point-of-sale systems used in restaurants. Among these POS providers are Aldelo, Microsale, rPower, and Maitre’D 7 & 8. If your restaurant is not currently using one of these POS brands, feel free to reach out to us to see if we can integrate with your current setup. Keep in mind that we frequently work with customers who do not integrate their food ordering system with their POS. We can still deliver orders to your restaurant through either a connected printer or fax machine. As you’ve probably already realized, we are more than your average provider of software for restaurants. We build custom websites for our customers, created by our expert designers with your brand and vision in mind. Even if you already have a website, it might be time to update your current make and model. Websites are not unlike automobiles in our opinion, in one very particular way. The landscape of what’s possible has changed so dramatically in the past half-decade or so that sticking with a static, HTML-based website when there are dynamic, mobile-responsive websites within your grasp is similar to deciding to drive a Model-T on the freeway while getting passed up by vehicles made by Audi or Porsche. Image Slider – You’ve seen it before, and you probably liked it. Image sliders are somewhat common these days, but that doesn’t mean they aren’t powerful. They are especially effective when we have quality imagery of your restaurant’s delicious menu items to feature. Keep in mind you can also showcase your restaurant’s interior, guests, employees, and anything you want to highlight your restaurant’s strengths. Contact Form – If you don’t provide a way for customers to get in touch with you to provide feedback, you’re falling behind your competitors. Considered a standard element for any business, we’ll make sure your restaurant phone number is visible while highlighting a contact form so that you can know how your customers feel about their experience with your business. Google Map – We’ll provide an integrated Google Map so that your customers can see where you are located, as opposed to simply providing an address and letting them figure it out for themselves. The more intuitive you make the process of coming into your dining room, the more guests you’ll end up serving. With only a few easy clicks, they’ll be on their way! Social Networking Links – While not a vital component to the success of your website or restaurant, it’s still important to have at least one social media account linked to your website so that your prospective guests can find reviews and confirm their interest in your establishment. We’ll make sure they find your Foursquare, Facebook, Twitter, Yelp, or any other account you might have with prominent links. Embedded Videos – Have some great videos on Youtube or Vimeo you’d like shown off on your site? We’ve got you covered. Search Engine Optimization – Our in-house SEO experts set your website up for success by orienting it to be easily indexed by search engines. This will improve your organic rankings on search engines like Google and Bing. The more free traffic you can get on your website, the better! If your website has gotten outdated, or even if you think you could use a bit of a facelift, feel free to reach out to us about our restaurant website design service. We are happy to help! If you are in need of a mobile ordering app, you might find yourself searching online for providers of a “restaurant online ordering app,” a “food ordering app for restaurants,” or some other similarly-phrased search query. Regardless, Online Orders Now will build a mobile web app with your restaurant theme! Included in this restaurant app are all of the same features that we listed above, from the contact form to an integrated Google Map to dynamic image sliders so that you can showcase your restaurant’s unique attributes! In the same vein as restaurant online ordering apps and websites for restaurants, we offer customers the ability to order for their mobile devices with Online Orders Now. You may have read that more customers are browsing the web with mobile devices than with laptops or desktops, and we’ll add to that IDCs analysis that the present day sees 87 percent of connected devices-sales are now completed using tablets and smartphones. With that knowledge in mind, we have created an online ordering software system that is optimized to provide the ideal ordering experience for customers. Utilizing the most recent frameworks to create a mobile-friendly format with quick load times and a bandwidth-friendly format, you can finally rest easy about the experience that customers have when browsing your mobile site. Our restaurant menu app allows in-person customers to browse a physical version of your menu before they order. Our Dynamic Printable Menu (DPM) affords your guests access to the most up-to-date version of your menu. While most of our competitors let you print out a PDF of your website’s menu, ours is always synchronized with the most recent changes you’ve made. Many of our clients offer catering as a supplemental service. Though it’s a great way to add a new revenue stream, providing a catering service is not without its own set of challenges. Given our experience and industry knowledge, we’ve developed a specialized catering menu available to our clients, complete with its own pricing, items, and quantities. Naturally, it’s available 24-hours a day, and you’ll even be able to customize your catering service area. Whether you want to expand, constrict, or keep it the same as your delivery service area is completely up to you! Lower cost – some competitors of ours charge upwards of 20 percent on each order! There are many, many other features that we have yet to address, however. For a full list with detailed descriptions of each Online Orders Now feature, you can find what you are looking for by clicking on the link above. Below you’ll find a few of the features that are the most practically beneficial to our average client. POS Integration We’ve said it before and we’ll say it again. Online Orders Now seamlessly puts each order into your POS and prints out the ticket while the customer is still online. It’s like having an invisible cashier who never makes a mistake! Discounts, Combos, Special Offers & Packages With regard to discounts, you can select either a percentage or a dollar figure off the entire order. This feature can be coded or might require a minimum amount purchased before being considered eligible. You can also customize it to only operate during certain times and days of the week, with these items only showing up on the checkout page. With regard to packages, you can set up individual boxes that pop up to promote any special(s) you have going on. The same custom features are available, with the added option of setting a minimum purchase amount or only adding one package to be added to the customer’s cart. We put you in control! 30 Percent Larger Tickets Did you know that customers who order online have a ticket size that is 30 percent larger (in terms of sales) than when they order over the counter? Because customers feel more at-ease from the comfort of the home, they don’t feel pressured by anyone waiting in line behind them, so they’ll typically “go for it” a bit more. With Online Orders Now, your customers will have the entire menu available to them so that they can find what they want and discover new menu items they may have never heard of before! With automatic upselling suggestions, we do everything in our power to maximize the average ticket price. Order Accuracy Because customers can take their time entering the order themselves, they are able to personally confirm their order’s accuracy. Further, our restaurant ordering software affords the restaurant to have online orders go straight to fax/email/text notification so that you do not miss an order even in the event of internet or POS failure. TIPS Functionality! Customers can tip right on the menu. We can default tip to 15 percent to level-set expectations for customers, while still maintaining the customer’s ability to change the tip amount if desired. Marketing Data The customer must provide their name, address, and zip code to complete an order. You can utilize this valuable marketing information by requesting it from us or by accessing it in the Admin. If you elect to integrate with your POS, customer data will automatically be sent and stored in your POS with each order. Other Features There are many other features and benefits we haven’t discussed, among them being coupon and discount security, a “pay later” function, and advanced ordering so that customers can choose when they want their order to be ready for pick up! Make sure you browse our full suite of features when you have the time. Online Orders Now offers seamless integration, loading our software onto your POS. Orders that are captured by the POS are printed automatically on up to five printers. Credit card orders go immediately to the merchant processor of your choice. We’ll even send you an email for confirmation. Again, all orders are sent to email and admin backup. If your internet goes down, we’ve got you covered with unlimited fax backup and text notifications. This is standard and is included no matter which package you choose. We offer the most profitable restaurant online ordering software available. Given the importance of being able to meet the modern customers’ needs in a robust way, we have formulated our online ordering software to be as useful as it is affordable. Below you will find the Online Order Now Pricing breakdown. 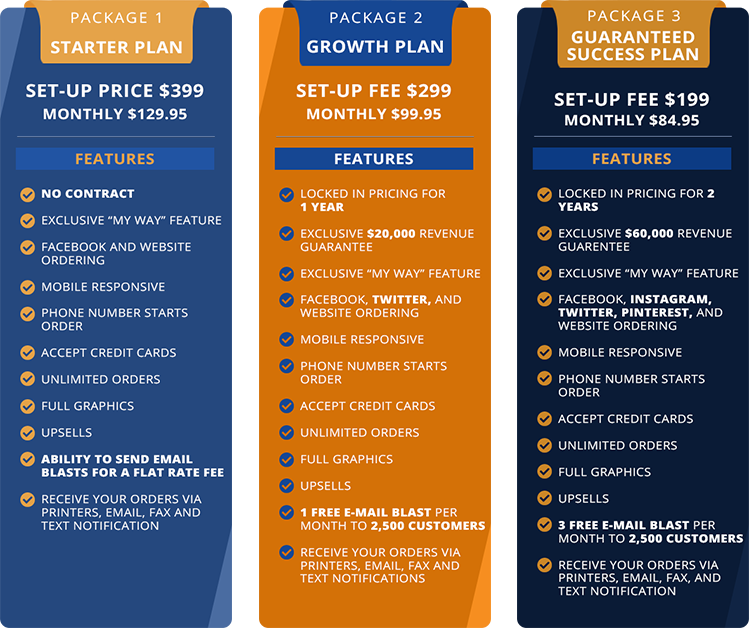 While the obvious difference between our Starter Plan, Growth Plan, and Guaranteed Success Plan includes incremental shifts in cost, there are plenty of other features worth your consideration. Keep in mind that our clients are able to upgraded to “fully-integrated” later on down the road. What’s more, our Exclusive Revenue Guarantee states that you will earn $20,000 in 12 months or $60,000 in the span of two years. If you aren’t able to achieve these numbers, we will cut your menu monthly fee in half until you do reach those numbers in the same period of time! As you can tell from the graph below, Online Orders Now clients often experience dramatic growth when implementing a sophisticated online ordering system like our own. 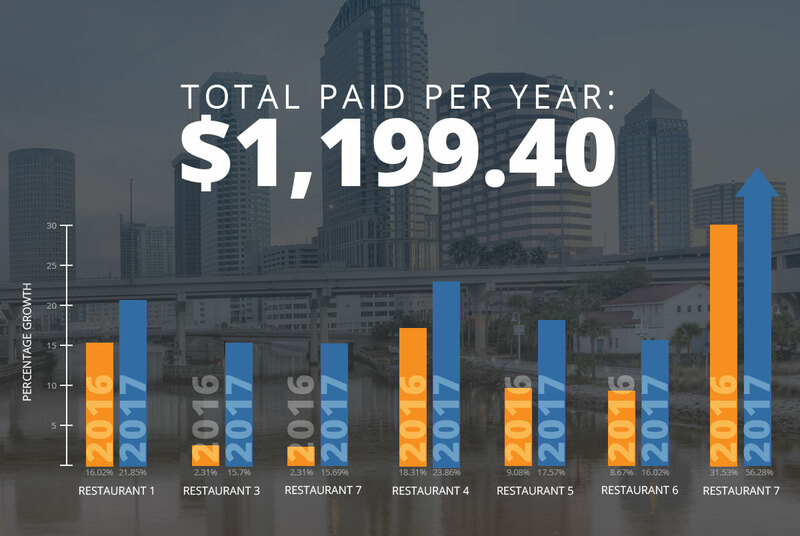 While we can’t guarantee each restaurant is going to see hyper-growth like that of “Restaurant 7,” the year-over-year revenue growth that each of these randomly-surveyed restaurants has experienced is indicative of the impact we can make for any restaurant. Adapting to the needs of the modern consumer isn’t a luxury for restaurants — it’s a necessity. Now that you understand the full breadth of our products and services along with how we can improve the efficiency of your restaurant’s POS and online ordering process, the next step is to schedule a free demo with a representative from Online Orders Now. If you are in need of a sophisticated restaurant online ordering software that will make a dramatic impact on your bottom line, give us a chance to transform your menu into an intuitive online application. With a $20,000 Additional Revenue Guarantee and a wealth of other practical benefits, Online Orders Now stands alone as the top online ordering software provider. We are passionate about the difference we make for our clients, so put us to the test! We’d love to learn more about your restaurant and how we can be a part of your financial growth. Schedule your free demo today.